Everyone has a different perspective on what an ideal New Year’s Eve celebration actually is. Some crave the adrenaline rush of an incredible night out on the town, while others want to gaze at the sparkling fireworks in the comfort of their pajamas. No matter what you prefer, an Isle of Palms New Year’s Eve is sure to deliver an unforgettable celebration for all desired levels of activity. Make sure to complete your visit by checking out our free Vacation Guide, packed with all of the best restaurants, activities, and shopping for your getaway with East Islands Rentals! What Isle of Palms New Year’s Eve Is Right for Me? A thrilling, upscale evening awaits you at the Yorktown Countdown. After purchasing a ticket, step aboard to find this 890-foot aircraft carrier transformed into a New Year’s Eve party of a lifetime. Seek comfort in the giant heated tent on the flight deck, which supplies magnificent views of the Charleston Harbor, the Ravenel Bridge, and downtown Charleston. Indulge in all-inclusive drinks while exploring three stages with local artists. Nonstop music allows you to dance the night away to the beats of funk, jazz, hip-hop, and more! Of course, the celebration isn’t complete without a spectacular firework show when the clock strikes 12:00 a.m. Spend your New Year’s Eve at the Yorktown Countdown event for a truly unmatched evening during your Isle of Palms vacation. The Windjammer is a favorite venue for live beachfront music that has been around for 46 years. All locals know that this is the best location to see popular Charleston musicians while drinking an ice cold beer. Take the quick, 5-minute walk from East Islands Rentals to experience their Isle of Palms New Year’s Eve celebration! Here, you can enjoy drink specials, great music, and an authentic Charlestonian party. If you want to ring in the new year like a local, visiting The Windjammer is a must. If you appreciate a more intimate approach to an Isle of Palms New Year’s Eve, take advantage of the beachfront access provided by our rentals for a firework viewing that’s absolutely free! People flock from various states and various Charleston locations to watch luminous fireworks reflect across the sea. Simply grab a beach chair and take a few steps onto the blissful Isle of Palms Beach, and you’re ready to sit back and enjoy the show. Or, if you prefer quick access to food and drinks, simply set up camp on your balcony and wrap up in a plush blanket for the most relaxing New Year’s Eve yet. 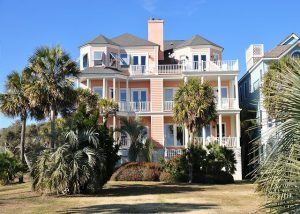 When you stay at East Islands Rentals, you’ll have plenty of options for your ideal Isle of Palms New Year’s Eve. Regardless of what activity you prefer, you can get the most out of your celebration when you book our Sand Serenity rental. After a night of firework viewing, take a dip in the soothing hot tub to complete your evening. How many others could say their year began in a Jacuzzi under the stars with a glass of champagne in hand? If you’re looking for an amazing start to the new year, you’ve found it at East Islands Rentals.